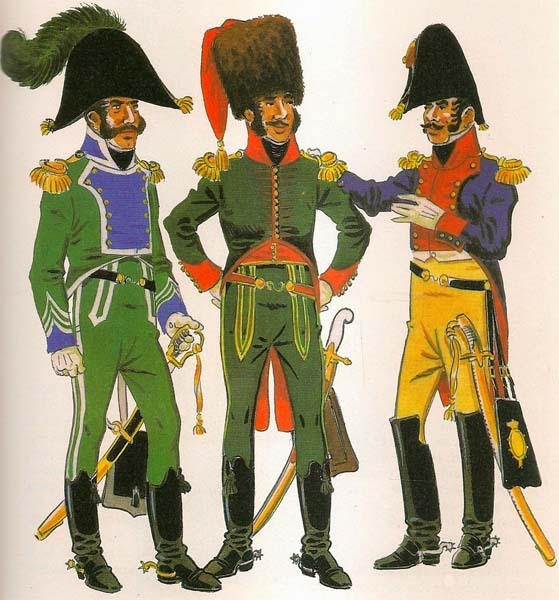 This is a rough guide to the Spanish General Officer and Aide-de-camp uniforms used during the Peninsular War & Napoleonic Wars. Full Dress Uniform (Uniforme de Gala) also known as the large uniform (gran uniforme). Dress Uniform (Uniforme de Media Gala) also known as the small uniform (pequeño uniforme). The uniform of general officers was regulated by the Royal Ordinance of March 20, 1793, which, at the outbreak of war, was still in force in its fundamental aspects. However dictates of fashion had changed the style of the uniform with such modifications as high collars and closed lapels. There are many paintings of general officers so there are plenty of sources on their uniforms. Some are painted in regulation uniforms while others have given way to personal taste. As the war progressed, a combination of convenience and shortage of resources could give much more ptactical campaign uniforms. A gold tipped cane (silver tipped for Brigadiers) was another symbol of the General Officer. There was no regulation for the general's weapons, either a sabre or straight sword could be worn. Generals could wear the sash or ribbon of the orders they possessed, from their right shoulder to left hip. Bicorns were originally worn side-to-side "athwart" style, but as time went by, front-to-back "fore-and-aft" style became more popular. A dark blue long-tailed coat. Collar, cuffs, lapels and turnbacks were scarlet. Gold buttons. Gold embroidered lace at the pockets and edging the collar, cuffs, lapels and turnbacks with two additonal bands of embroidered lace on the cuffs (making three in all). Scarlet waistcoat. Scarlet sash with three columns of gold embroidered lace. Scarlet breeches. Cavalry boots were worn when mounted, or shoes when dismounted. Black bicorn edged with gold lace, a white ostrich feather sewn along the edge on the inside, the red Spanish cockade and red plume. The service uniform was the same as the dress uniform but with only the gold embroidered lace edging the cuffs and lapels as well as on the sash. There was no extra lace on the cuffs. The breeches and waistcoat were usually buff but could be white during the summer. The coat was often worn with closed lapels. The bicorn could be worn plain, perhaps without the plume or ostrich feather. The full dress uniform was the same as the dress uniform but with the gold embroidered lace added at the seams and only two bands of embroidered lace on the cuffs. The saddlecloth was scarlet edged in a wide band of gold lace and thin dashed line of gold lace. The holster covers were scarlet edged in a wide band of gold lace. Field Marshal in Dress Uniform. Left: Field Marshal in Full Dress Uniform. Right: Field Marshal in Service Uniform. Portrait painted by Vicente López Portaña. 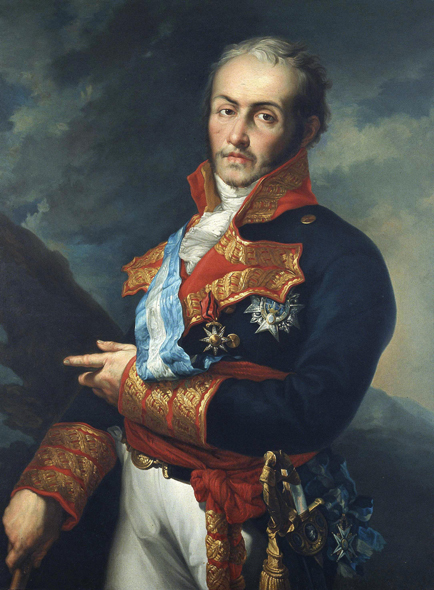 In 1802 he was appointed Capitán General of Catalonia. The full dress uniform, dress uniform and service uniform were the same as that of the Field Marshal but without embroidered lace at the seams, with only one additonal band of embroidered lace on the cuffs (making two in all) and two columns of gold embroidered lace on the sash. The bicorn was edged with a black (instead of white) ostrich feather. The saddlecloth and holster covers were scarlet edged in a wide band of gold lace. Left: Lieutenant-General in Full Dress Uniform. based on a portrait of Don Pedro Villacampa. as are the two bands on the hanging part of the waist sash. 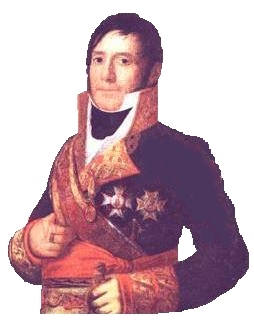 Teniente General Gabriel de Mendizábal Iraeta. The full dress uniform, dress uniform and service uniform were the same as that of the Lieutenant-General but with no additonal band of embroidered lace on the cuffs (just one band) and one column of gold embroidered lace on the sash. The bicorn was not edged with an ostrich feather. 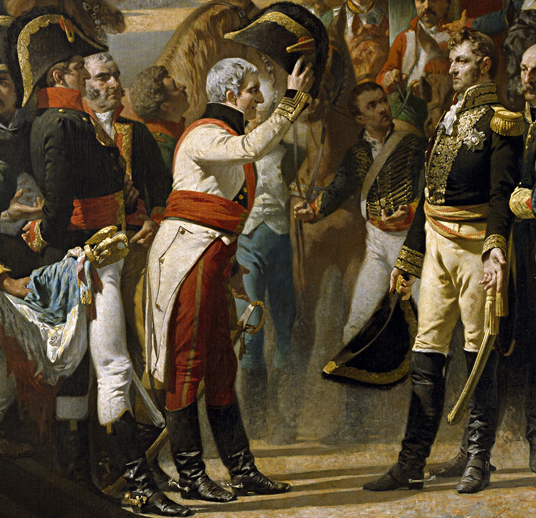 Left: Major-General in Dress Uniform, based on an engraving by Alix. the plain sash and the hussar boots. facings, the unusual horse blanket and plume which appears to be an ostrich feather. A dark blue long-tailed coat. Collar, cuffs, lapels and turnbacks were scarlet. Silver buttons. Silver embroidered lace edging the collar, cuffs, lapels and turnbacks. Scarlet waistcoat. The scarlet sash with silver embroidery was not used during this period, only later. Scarlet breeches. Cavalry boots were worn when mounted, or shoes when dismounted. Black bicorn edged with silver lace, the red Spanish cockade and red plume. The dress uniform and service uniform were the same as the full dress uniform but with silver embroidered lace edging only the cuffs and lapels. The breeches and waistcoat were white. The saddlecloth and holster covers were scarlet edged in a wide band of silver lace. Left: Brigadier in Dress or Service Uniform. Centre: Brigadier in Full Dress Uniform. 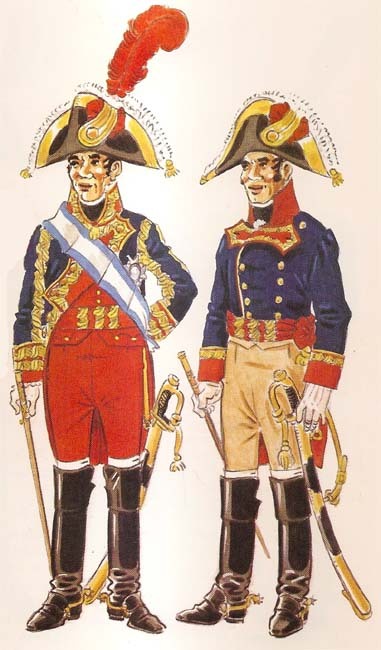 Right: Brigadier based on a portrait of Don Martin de la Carrera. Many Generals were also Colonels of a regiment. It was popular for them to wear their regimental uniform and add the distinctions of their General's rank. Many portraits show this. In addition to the three cuffs laces of a colonel they would add the one, two or three stripes of embroidered cuff lace appropriate to their rank. Where appropriate, a scarlet sash with embroidered lace would be worn. The General's bicorn would be worn and their cane carried. based on a portrait of Don Salvador del Muro. The hat lacks its expected black ostrich feather edging. collar colour wrong; it should be white piped with black (not black piped with white). ADCs had been created in 1728, with a regulation blue uniform with red facings. There appears to be no later regulation and the older regulation appears to be still in force in its fundamental aspects. However dictates of fashion had changed the style of the uniform with such modifications as high collars and closed lapels. There is however a plate by the German artist, C. Suhr, who had the opportunity to see the troops of the General de La Romana passing through Hamburg and to take notes of the large number of Spanish uniforms of the famous "Danish Expedition". A dark blue long-tailed coat. Collar, cuffs, lapels and turnbacks were scarlet. Gold buttons. ADC's were usually captains and wore the two gold epaulettes of that rank. On the right shoulder, the characteristic gold aiguillette of an ADC. White waistcoat. White or Buff breeches. 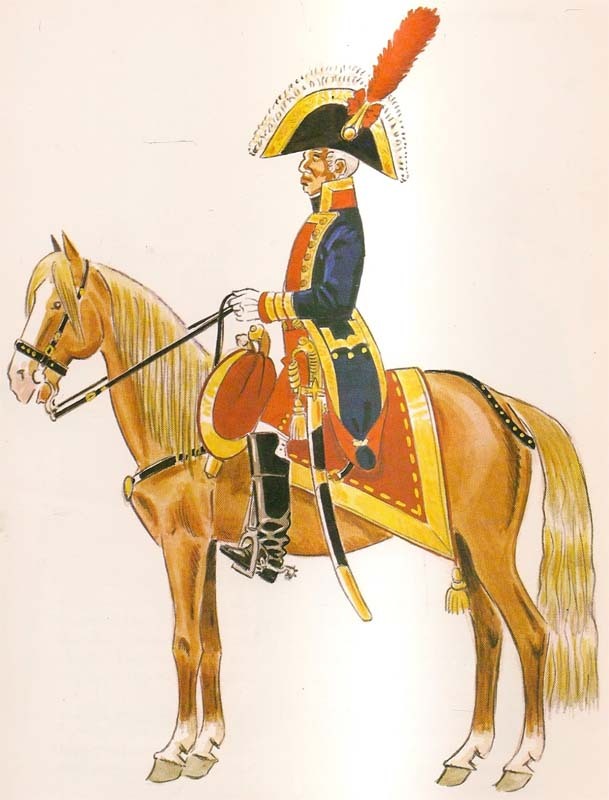 Cavalry boots, hussar boots or shoes were worn as appropriate. 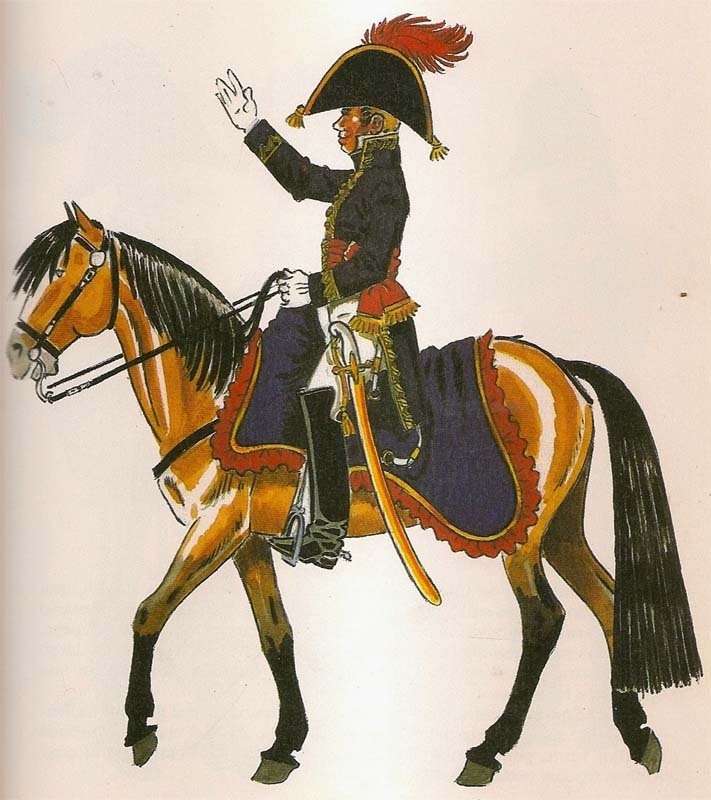 Black bicorn with the red Spanish cockade and red plume. 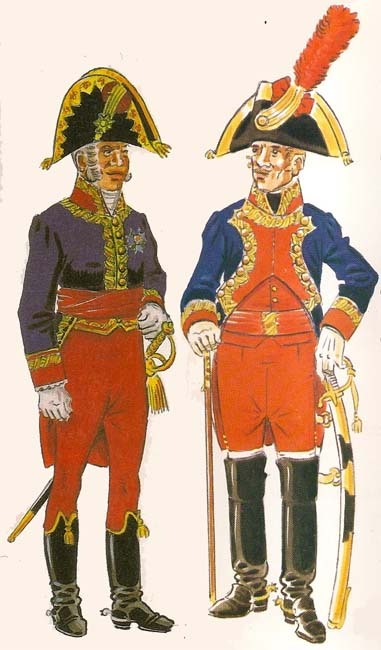 Paintings by the English artist Denis Dighton in 1813 show that the regulations were not always followed, and Spanish ADCs were wearing fancy uniforms in the style of their French opponents. The ADC to General Ballesteros is shown in a green uniform with blue facings piped white and a black bicorn with a green plume. The ADC to General La Peña is shown in a green uniform with red facings and waistcoat and a black colpack (or busby) with a red bag. 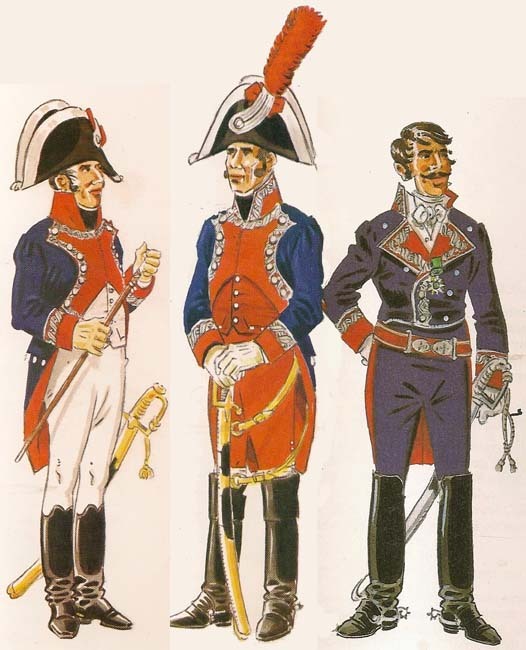 Centre: ADC to General La Peña 1813. 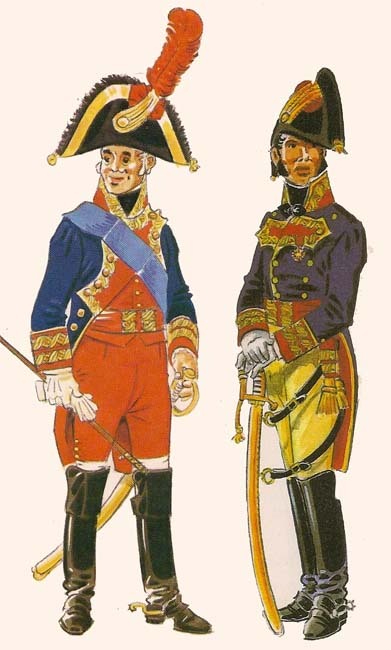 Right: Regulation Service uniform, without plume or aiguillette.